This evening just as the sun was setting, the sky was just so beautiful. Blue sky as though its daytime. I was busy in the kitchen when hubby shouted out “come quickly, look out of the window.” I had to reach out for my iphone and take a photo. Nature is amazing and pleasures us with so many different colours in all shades imaginable. Its important that we take time to observe and enjoy nature. Its brings immense joy and peace to our mind and soul. When you don’t stop to admire nature you miss out on the wonders of world. Today’s recipe is Farali Uttapams. My partner Ramya of Lemon Kurry gave me the ingredients little millet and yogurt. Our theme for March 2016 for the shhh cooking secretly was whole grains. Fellow members have come up with some really delicious, innovative recipes following this theme – right from soups to energy bites. I decided to make farali uttapams using little millet and sabudana (tapioca, sago balls). Millet is the most nutritious, easily digestible and non allergenic grain. Its a great alternate to rice and is cooked like rice.I found all the different names just too confusing so decided to put it down in a table form for easy reference. All the information is sourced from google and wikipedia. Farali uttapams are gluten free and healthy. You can have them even on days when you are not fasting. Wash and soak little millet and sabudana in warm water for 2 hours. I prefer to soak them separately. Drain out the water from both the little millet and sabudana. Grind both in a food processor to a thick paste using very little water. I used only 2-3 tbsp. Add the sour yogurt and mix well. Cover and let the batter ferment for 6-8 hours in a warm place. Add ginger, chilli pastes, pepper powder, salt and cumin seeds. Mix well. Add soda bicarbonate also if you are using it. Heat a pan or tawa over low heat. Rub a little oil over it. Add a ladle full of the batter and spread it a bit just like you would do so for pancakes. Add a bit of grated carrot, chopped tomato and chopped chillis over it. Drizzle a little oil (about ¼-½ tsp) around the uttapam. Cover the pan or tawa with a lid and let the uttapam cook over low heat till its done and the bottom is light golden colour. Flip it over for the carrot and tomato to get cooked a bit. After a few seconds flip over again. 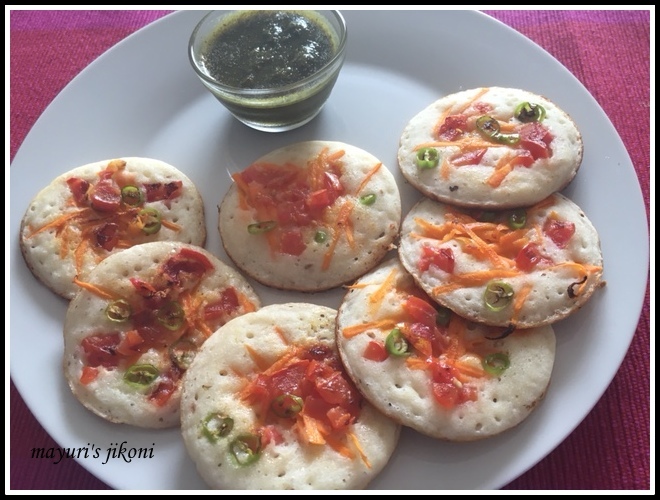 Serve uttapam with your choice of chutney. If the batter is too thick add a little water. If the batter becomes too thin add some amaranth (rajgira) or arrowroot flour. You should have a pancake like or dosa like batter. You can add chopped coriander, grated paneer also. If you are not making these uttapams for fasting then you can add chopped onions and any veg of your choice. There is a chance you're qualified for a complimentary Apple iPhone 7.